LIMA, May 30 2012 (IPS) - A unique response to the challenge of global warming is happening in rural areas of Peru, where a network of indigenous elders is working out how to adjust weather forecasts in the light of climate change, while taking measures to safeguard their crops. “Before, things happened at the right time. Now, strange things are going on with the climate.” This is the kind of comment that is heard frequently in dozens of rural communities throughout the departments (provinces) of Puno, Cuzco and Apurímac in the country’s southern Andean highlands. Campesinos (small farmers) in these highland areas, where the vast majority of the population is indigenous, are increasingly concerned about the sudden changes in weather that affect traditional crops like potato, maize or quinoa. “People are clearly aware that the rains arrive early or late, the wells dry out quickly, frosts come at any time, the soil is more compacted due to the heat and because water does not infiltrate into the soil to the same extent,” sociologist Ricardo Claverías with the Centre for Research, Education and Development (CIED) told IPS. Since the 1980s, the CIED has worked to protect and preserve the traditional knowledge of campesinos in a score of communities in Puno. “We know the climate is changing by looking at nature. For example, up until 10 years ago, that ‘apu’ (mountain peak) had snow on its crest all year round,” Valentín Ccahuana, leader of the Ccasacancha community in Apurímac, told representatives of the United Nations Joint Programme on Climate Change in Cuzco. 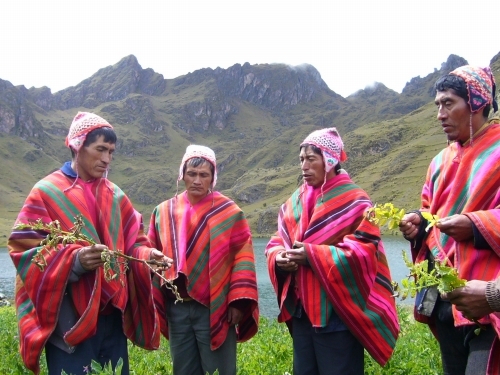 But indigenous campesinos in the highlands have developed a wealth of traditional knowledge over generations from observation of bioindicators, like the behaviour of plants and animals. “Their accumulated experience gives them an edge on dealing with the challenges posed by climate change today,” Edwin Mansilla, head of the environmental management division of the Cuzco regional government, told IPS. Some elders have developed expertise in climate forecasting. In Puno, they are between the ages of 60 and 75, according to research undertaken by Claverías. In Cuzco, too, discerning weather trends tends to be a function of older members of the community, although some of the local forecasters are as young as 30 years old. “If the community elects them, young people can take on this role,” Flora Salas, a leader of the Cuzco village of Huañaccahua, told IPS. The traditional weather forecasters are known as “arariwa” in Quechua, translated as “guardian of the fields”. A village of 100 to 150 families in Puno may have 20 arariwas, according to Claverías. They share information with their counterparts in other communities, and thus build up a network. The exchange of information traverses the Andes mountain chain. Claverías states that campesinos working as seasonal agricultural labourers in the Pacific coastal region of the country make a point of returning to their communities to share their weather observations. The wise elders hold meetings and keep formal minutes of their predictions and their recommendations for which crops should be sown in the coming months. On the basis of these pronouncements, the community organises itself and reaches decisions that everyone must respect. An arariwa reads the signs that are written in nature. If a wild cactus species with edible fruit, called sancayo, produces abundant flowers in August, it is a sign the potato harvest will be good. And if the qanlla plant grows densely in November, there will be plenty of quinoa and cañihua – protein-rich grains – in April or May. If certain birds build their nests high up on the floating reed islands on Lake Titicaca (on the border with Bolivia), there will be plenty of rain, but if they nest low down on the islands, there will be drought. And when seagulls can be heard, a storm is coming, and people run for shelter. Although traditional wisdom is mentioned as a factor in Peru’s national strategy on climate change, the government lacks a specific policy to incorporate it. However, some regional authorities and especially municipal authorities do work with local campesinos on this problem, several sources told IPS. Claverías describes the indicators used by Puno campesino communities to predict the weather in the 1989-1990 agricultural season, when there was a severe drought, and in 1997-1998, when there was a major El Niño event – a cyclical climate phenomenon characterised by unusual warming of the waters of the Pacific ocean, which impacts weather over many areas of the globe. Then he compares the margin of error of the arariwas’ predictions with those of scientists and official bodies. He found that in most cases, the traditional elders’ forecasts were accurate. A similar disruption of traditional knowledge can be observed in indigenous communities in other countries, like Colombia. In addition, the poverty in these communities means that their members have to do different types of work in order to survive – in cities, or as seasonal farm workers in other regions – which is distancing them from contact with nature. And their predictions “are interpretations limited to a single eco-region and cannot be generalised to a wider area,” the study says. In response to these limitations, several arariwas “are fine-tuning their observations and discovering new bioindicators to be taken into account,” as well as further prevention measures, said Mansilla, the Cuzco government official. Campesinos are developing adaptation methods, such as planting earlier or later to match the rain patterns of recent years, growing crops in different ecological niches to test their resistance, and diversifying the crops they cultivate. “Many agricultural experts used to ask small farmers to plant monocultures (of a single species), but now we realise they were right, and we believe it is best to plant multiple varieties, as a better means of managing risk,” Mansilla told IPS. In Huañaccahua the community decided to plant two crops of potato at different times, based on the rainfall pattern over the last three years. “And it has worked well,” the 39-year-old community leader, Salas, told IPS. Travelling in rural areas, IPS found that campesinos blame climate change on the neglect of cultural practices, such as ceremonial payments to Pachamama (Mother Earth), or on the environmental damage that human beings have caused. “Young people nowadays do not respect Pachamama, and do not give her thanks for everything she gives us. It is time to reflect on how to help the Earth, and how to help human beings continue to live in harmony with nature,” Ccahuana said. But although people are nostalgic about the old ways, the campesinos are nevertheless entering the market system, through improved crops with increased yields, or by manufacturing and selling dairy products, so that their families are not dependent solely on what their small farms produce, Claverías said. “Climate change is both a challenge and an opportunity,” he concluded. *This article is part of a series supported by the Climate and Development Knowledge Network (CDKN).